UAE building giant outlines how record-breaking achievements are fuelling construction at Select Group’s $1bn Marina Gate. UAE building heavyweight ALEC is making impressive progress on Select Group’s three-tower Marina Gate in Dubai Marina. The high-end lifestyle project is located in a super-prime site of one of the city’s top residential hubs, and the client has spared no expense on it, with a gross development value of $1bn (AED4bn). Currently, two of the three towers are under construction at the picturesque Marina Gate project, which boasts spectacular views of yachts and the shimmering towers punctuating the neighbourhood’s skyline. Marina Gate consists of more than 1,400 podium-level villas and high-rise apartments, split across two residential towers, and one mixed-use premises managed by Dubai’s Jumeirah Group. Residents living in the triumvirate of towers have access to enviable health and fitness facilities, including an excellent gym, an infinity pool, squash and paddle tennis courts, as well as ground-floor retail stores. ALEC is the main contractor for the multi-phase project and the company began construction on Marina Gate’s first tower (MGI) in March 2015, following completion of enabling works, which began a year earlier. MGI, which covers a total built-up area of more than 10ha, is the shortest of the three towers with 52 levels, and has 389 apartments and 10 villas. Building work for the second and tallest tower, MGII, kicked off in January 2016. It boasts 65 levels and occupies a total built-up area of 12ha, with 511 apartments and eight villas. ALEC began work on the third tower, Jumeirah Living at Marina Gate (JLMG) in July 2017. Select Group’s Jumeirah-branded building has 57 levels, covers a total built-up area of 11ha, and comprises 473 apartments and 15 villas. While residents are already living in MGI after ALEC handed over the first tower to Select Group in March 2018, the main contractor’s scope is not quite complete; it is still in its defects liability period, which means it is required to fix snags within the first 12 months of the building’s operations. With structural work done on the second tower, MGII is approximately 92% complete and on track to be finished later this year. JLMG is roughly a third complete, and ALEC expects to top it out in April 2019. A tentative date of 2020 has been set for completion of JLMG. With thousands of workers – 1,200 on MGII and 1,100 on JLMG to be precise – on site, ALEC’s senior project manager, Johan Moolman, says the project can be “quite hectic” to manage. Moolman, who was named Project Manager of the Year at the Construction Week Awards 2018, says work on both towers is progressing at a good pace. ALEC is clearly hitting its stride on Marina Gate and has already broken a company record twice for using the tallest tower crane in its history. The record was set on MGI using a Liebherr 280 EC-H 16 high-top crane that topped out at 240m from its base. ALEC broke this record again in March 2018 for MGII when the crane topped out at 288m. Liebherr’s Litronic crane was erected and commissioned on site in October 2016, with a freestanding height of 56m. It was operational for a total of 743 days, clocking up more than 7,400 working hours going non-stop, seven days a week. It was only down for 51 hours during this time, and thus boasts an impressive breakdown rate of just 0.0068%. A 500-tonne mobile crane with a super lift will be used to help dismantle and remove the big crane. ALEC will break its own record for the third time when it tops out Ithra Dubai’s One Za’abeel Tower, with a crane mast height reaching more than 330m. While this work is impressive, the contractor’s work stands out for more than just its record-breaking equipment applications. Marina Gate is the largest design and build project that the company has ever worked on with its major subsidiaries Alemco – its mechanical, electrical, and plumbing (MEP) arm – and ALEC Fitout. ALEC is the main contractor and is responsible for the complex and heavy construction work, including the structural scope. Its contracts for MGI, MGII, and JLMG are respectively valued at $125m (AED460m), $150m (AED552m), and $159m (AED585m). Collectively, the three contracts total $434m (AED1.5bn). Values for the fit-out and MEP deals have not been disclosed. ALEC has “done one or two smaller design and build jobs” in the past, but Moolman says Marina Gate is the first one on such a big scale, with Alemco delivering MEP services, and ALEC Fitout working on the interiors. The business is working with more than just its subsidiaries on Marina Gate, though, and is using robotics to automate plastering, panel installation, and chasing work, Moolman says: “What we did in terms of innovation was to use a robotics system that holds the façade in place, so you can fix it from the inside of the building rather than the outside. “This means you don’t need to use cradles and all that equipment. There are about 80-90 façade panels on each floor, and you can complete one floor in about two days, but if you use the traditional method, it would probably take double the time, so you could probably save yourself 50% of the time with [the robotics system],” he adds. ALEC uses an automated plastering machine to accelerate the time it takes to coat a wall, which helps to improve quality and efficiency, says Moolman. It also helps to reduce waste, as it creates a smoother area that only requires a few touches to complete the plasterwork. A chasing machine is also in use to reduce the amount of labour and time required for MEP chasing work. The normal method requires approximately six workers to use a block saw and chisel to carry out the scope over three days. Automating this task allows a team of three to complete the work in one day. Another factor supporting the construction programme is the ‘resolution matrix’ that has been jointly implemented by Select Group and ALEC. The system is designed to ensure minor building issues are addressed quickly to prevent problems from escalating further down the line. “We tell our people that if you can’t resolve something within 24 hours, you elevate it to the next level of management, and you keep on elevating it until you have a resolution,” Moolman explains. “If we can’t reach an agreement on the ground, we elevate it to senior management and that would, if necessary, go all the way up to the top and back down again. Shortly after Construction Week visited Marina Gate, Dubai Electricity and Water Authority carried out its first inspection on MGII, marking a significant milestone for the second tower. To date, ALEC has delivered seven projects in Dubai Marina, but never before alongside its sister companies Alemco and ALEC Fitout. 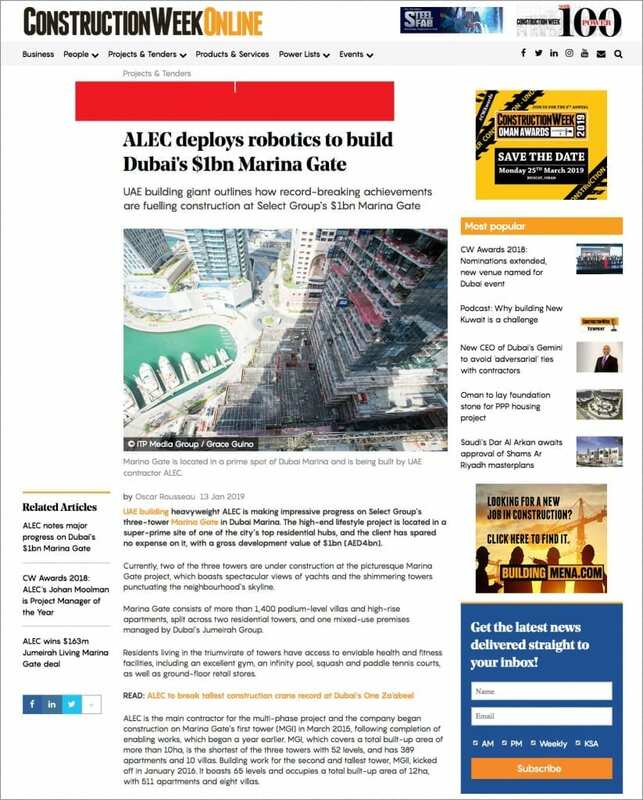 As is evident, through greater collaboration, embracing the power of automation, and adopting high-standard management controls like the resolution matrix, ALEC’s work on Marina Gate is impressive for a number of reasons.